PETERSHAM- Early in the morning of September 2, 2018, Alan joined up with his canine companions that passed before him and went for a walk. He was surrounded by love as he began this journey. Alan, Jr. was born in Philadelphia on 12/27/40 to Alan and Olga (Goldberger) Bachrach. He received his veterinary medical degree from the University of Pennsylvania School of Veterinary Medicine. After finishing an internship at Henry Berg Memorial Hospital in Manhattan, Alan went onto complete a fellowship at Angell Memorial Hospital in Boston. His residency in ophthalmology was at The Ohio State University. Alan founded his specialty practice in ophthalmology just outside of Boston. In addition to practice, he was involved with many research projects, instituted clinical ophthalmology rounds at MSPCA Angell, and established the ophthalmology department at the Tufts University School of Veterinary Medicine. For many years he provided clinical support to the University and contributed to the academic curriculum. He loved to teach! His favorite zinger on the ophthalmology final at Tufts was to ask students to spell the name of the class. “Dr. B” was loved by his clients and known as a compassionate man with a great sense of wit and humor. Alan is survived by his wife and best friend Debra, two great dogs Zoe and Bella, and a nice crew in the barn. He embraced the closeness of his family and friends; they sustained him. Alan requested a party be held that would be full of life and fun, along with his favorite food…pigs in a blanket. On September 22, we will gather in the east field of the Bachrach home located at 139 East Street in Petersham, Ma. Email alantribute@gmail.com with any questions. We will convene at 2p and a tribute to the life of the guy everyone seems to have known will be 3:00ish. 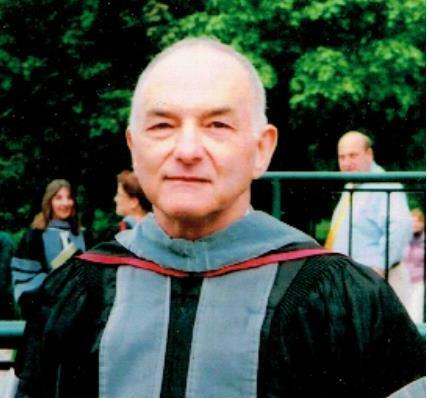 Memorial contributions may be made to Mass Lions Eye Research Fund (MLERF), c/o Dr. Jim Roth, 43 Stewart Terrace, Belmont, MA 02478 or to Class of 68 Scholarship c/o Office of Advancement, Alumni Relations, University of Pennsylvania, School of Vet Med, 3800 Spruce Street, Suite 172E, Philadelphia, PA 19104-6047.